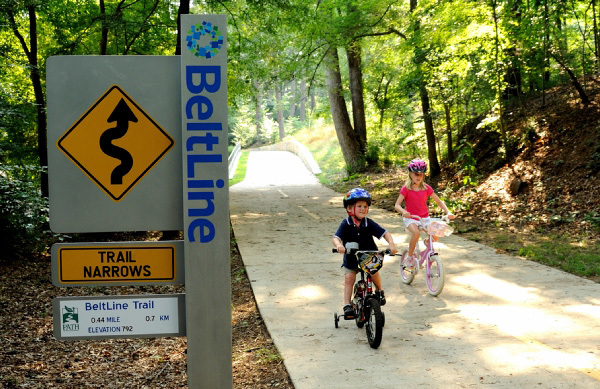 In 2004 the renowned park planner Alexander Garvin produced The BeltLine Emerald Necklace: Atlanta's New Public Realm, a report that provided an exciting vision to Atlanta residents: a 22 mile loop of historic railroad that circles downtown and midtown Atlanta could help to reinvent the city if refurbished and made into a green corridor. The mostly abandoned rail corridor, known as the Beltline, connects 45 diverse neighborhoods, including many of the city's most underserved by parks. The report showed that revitalizing the Beltline would provide an extraordinary opportunity for economic development – including affordable housing – and to connect communities through green space. Atlanta ranks very low on the list of U.S. cities with respect to available parkland per capita, and the report helped to get the Beltline project approved by policy makers. Then we got to work. To date, The Trust for Public Land has acquired some 33 properties as a partner in the Atlanta Beltline project, which will increase Atlanta’s greenspace by nearly 40%. It will add 1,300 acres of new parks and will connect 40 new and existing parks. The Beltline is one of the most ambitious urban revitalization projects in the country. The project is expected to generate more than $20 billion in new economic development, to create 30,000 new jobs, and to create more than 5,000 new units of affordable housing over 25 years.